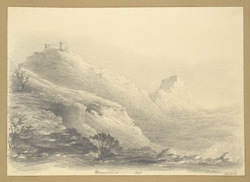 Pencil drawing of Purandhar Fort by Alexander Nash (fl. 1834-1846) in 1845. This image is from an album of 19 drawings depicting the monuments of Bijapur and the hill forts of Dejouri and Purandhar, made during a Revenue Survey of the Deccan. Nash served with the Bombay Engineers and from 1836 was mainly employed in the Revenue Survey of the Deccan, first as an assistant and from 1841 as Superintendent. Purandhar Fort is situated on a basalt cliff commanding a passage through the Western Ghats in Maharashtra. There are actually two forts on this site, Purandhar, the stronger of the two and the lower fort of Wazirgarh, or Vajragad. The fortifications are protected by a wall which is 42 km in extent and relived by three gateways and six bastions. The earliest fortifications on this site date from 1350 and there is also a Mahadev temple near to the Delhi Gate of the fort. Later it became one of the most important strongholds of Shivaji, the independent Hindu king of muslim (Mughal) dominated India and was also a retreat for the Peshwars until in 1818 when it fell to the British under General Pritzler.